After having perved at the Fitness First Swimming pool for nearly 2 months, from my vantage point at my new office, I am proud to say that I’ve taken the plunge! Literally and figuratively! This is the longest pool I have ever been to that is not owned by some sports association or one of the public Olympic sized pools. It was great to be able to get from my office to the pool in less than 5 minutes. I got to Fitness First easily enough. After getting into your swim gear, one has to walk from the changing rooms, pass half the gym AND past the reception area before reaching the pool. It was a bit weird, but luckily no one stared. Of course I had my towel, but then I was also barefoot. The pool was totally empty when I got there at 6pm although 2 other people joined me in the time that I was there. The pool is heated, which is something I don’t like. When I first got in, it was quite nice because it felt quite warm, but no where near as hot as a Jacuzzi. But within a minute, I got used to the heat and it felt as if I were swimming in a pool of luke warm water. Not a very pleasant feeling I can tell you. I wonder if Fitness First will take to my suggestion to turn off the darn heater. 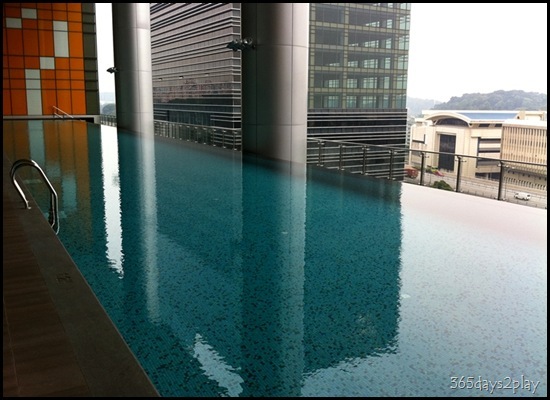 It’s not snowing in Singapore, we don’t need heated pools! The water apparently is heated using excess heat produced by the air-conditioning of the gym, which makes it very eco-friendly. Now this is something that I personally feel sounds great on paper but is terrible in reality. ANYWAY, the swim itself was good. It was great that the pool was long so I could do laps in peace without having to turn around that often. Shall comment more on the gym equipment at a later date!